We suffer poor time management more so than any others…Why? 1) We have very poor short term memory. 2) Secondly, we have organisational issues. 3) Thirdly, some having planning and processing issues. We can’t ever blame ourselves for any of the above as we are born with a very active right side of the brain (creative), whereas Time management is very much a function of the left linear brain. However, many get frustrated by our time-keeping and therefore it has to be worked at and improved for the sake of everyone. You need to sit down and take stock and plan ahead. My time keeping was terrible as a child, however now it has swung the other way. I leave myself twice as much time as most to get going and I always arrive at functions/meetings early. T this day I still set all my clocks five to ten minutes fast. - One helpful tool is a colour coded diary for school and social time. movement much easier than we would a watch or clock. - Post-it Notes on your door (to write messages and reminders). I still hang things on the door that I need to take with me. - Use your smart phone to take images of books required for school, etc. - A notice-board on the wall can also be useful. As we have already mentioned, time management is linked to our ability to organise and we don’t have that. Your preparation should start on a Sunday before the new school week begins. Do it whilst you are fresh and alert, don’t leave it till Monday morning when you are still half asleep. You could even find that you sleep better, as you have already organised and sorted all the things that are on your mind to do the next day. If you are like me and forget so many other things that keep our lives functioning (shopping, sports, social outings, etc. ), put all those other troubling things onto post it notes, etc. Even do a road map, a very good way of learning how to organise… put on your day or week A to Z. You must also schedule free time and breaks. Is worthwhile during routines like homework…maybe 10 mins every hour, but be disciplined and don’t stretch the free time! Don’t play video games before you go to bed. Take an hour or so to do something less complex to help you sleep. Schedule study time so you can get ahead. Try to work at some point over the holidays and at weekends to give you space in the week. 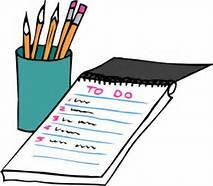 A To-Do list is also a very good way of getting and thinking ahead. Being untidy is also a sign of poor organisational skills… it's far harder to find things and quickly in an untidy and cluttered space, so include that on your list. Always put your keys and/or phones in the same place every time and do it the second you get in. You will very quickly do all this subconsciously, trust me you will… I did. It means you only have to visit the one place then, and yes…they are there. Men tend to be worse than women when it comes to time management, as they tend to have greater lists and tend not to write things down. Poor time management actually robs you of more time through living in chaos, always chasing your tail. Most importantly, poor organisation causes increased stress and anxiety.